After a big day in Bangkok and with a trip to Chatuchuk Market planned for the following day Tina suggested we have dinner in the riverside restaurant at our hotel. Normally I don't go for eating at the hotel but I was also exhausted after trekking around the city all day and we had ordered a few dishes from Aquatini for room service the night we arrived and they were pretty good so I agreed. It was nice to just wander downstairs for dinner instead of having to get a tuk tuk or taxi and try and then find our way home with very full bellies as is usually the case. 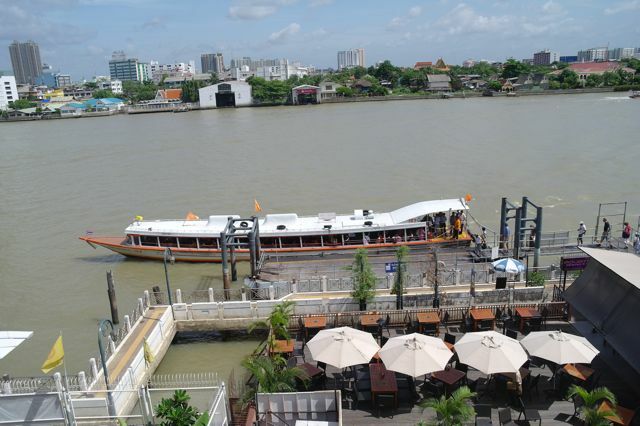 The restaurant is actually very beautiful and sits right on the Chao Phraya river near the Phra Artit ferry pier. Our room looks over the river and restaurant, both of which are spectacular at night. Tina had another reason for wanting to go to Aquatini, cocktails! We settled in quickly and ordered to delicious mojitos to get us started. 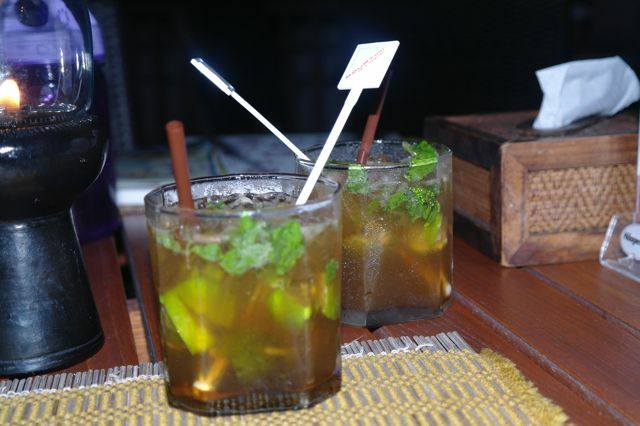 I think they use a bit of dark rum here which makes the mojito browner than we are used to but they still extremely are delicious, I could drink these all night. 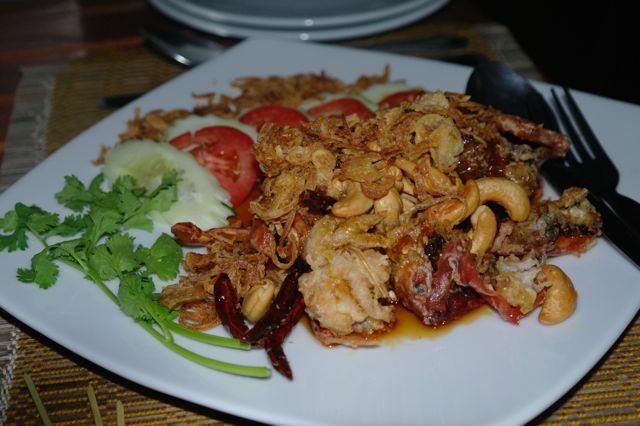 No trip to Thailand is complete without eating some soft shelled crab and the Aquatini version with cashews and a sticky tamarind garlic sauce is excellent. I just love these sweet tamarind chilli sauces, they go with just about anything but fried seafood works especially well. I also had a secret agenda for agreeing to dine at Aquatini. 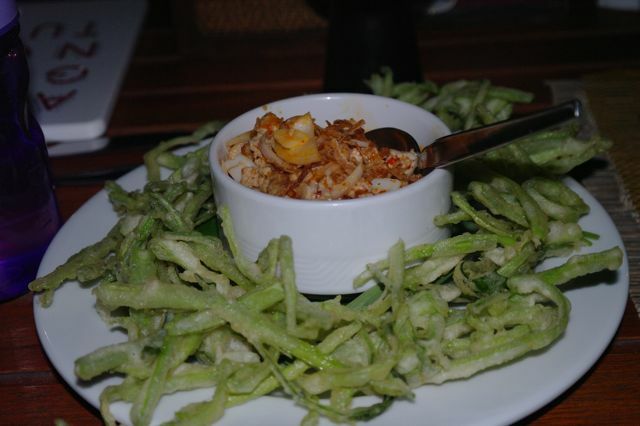 I have only recently discovered Yum Pak Boong Krob (Deep Fried Morning Glory served with Seafood and Minced Pork Spicy Dressing) and it is currenlty my absolute favourite Thai dish. I know of only one place you can get this amazing dish in Melbourne but will be keeping that secret until I get home. The crispy morning glory is fantastic and the light curry sauce is superb. The curry sauce is similar to Tom Yum but creamier like a curry with succulent chunks of prawns and squid and lots of other extra flavours that I can't even begin to describe. 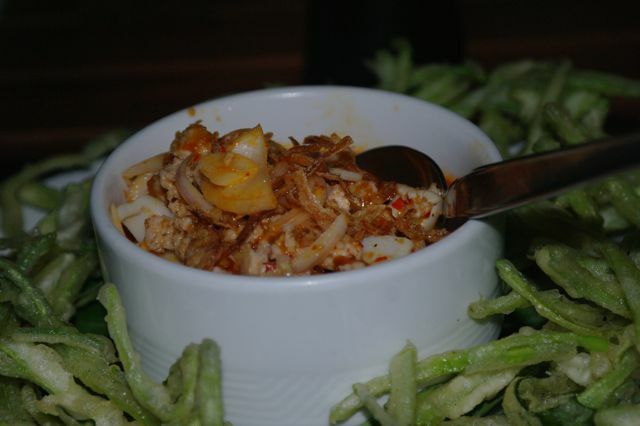 Needless to say this is a must try Thai dish for anyone who loves Thai food. The Aquatini version is excellent and the good news for those in Melbourne is that the local version that I will post about soon is just as good! 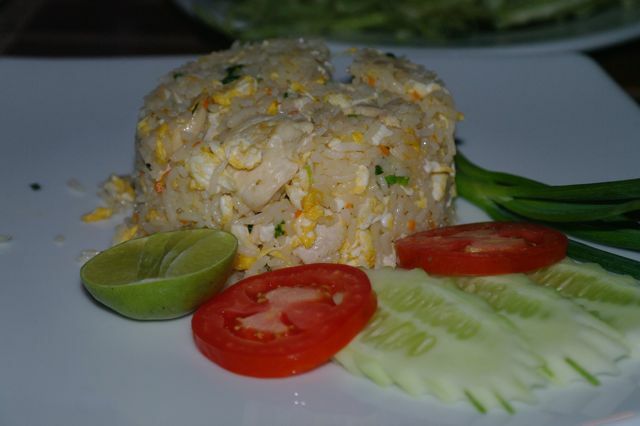 No Thai meal is complete without rice so we ordered a serve of Khao Pad Gai (Chicken Fried Rice). I love fried rice (as does Charlie) and this was a great accompaniment to the other dishes. I think a lot of the hotel guests eat all their meals at Aquatini and while that isn't my style I can see why they do it. Ignoring the western section with offerings of spaghetti bolognese etc the menu is quite extensive and has a much wider range of Thai dishes than many Melbourne Thai restaurants. Judging by the quality of the meals we enjoyed, the cooking is also of a very high standard which in a city like Bangkok is pretty much mandatory. With so many excellent eating options available, those who are less than great don't last very long.